Today we’re going on a journey of the imagination. Look at the photo above. Now close your eyes and imagine quick and easy drop biscuits topping that bowl of appley, chickeny goodness. That, my friends, is some simply delicious pot pie. Now, you may have mixed feeling about pot pie. Those frozen hockey pucks with cardboard crusts and thin, bland filling. Dear friends, make no mistake, that is not potpie. If the prepackaged variety is all you’ve ever known, this recipe may change your mind, and your life. Before you start saying “I can’t make potpie, it takes too much time” or “I love potpie but I have an irrational fear of making dough”, take a moment. Imagine a potpie that doesn’t require a rolled crust or an all day commitment. Does that sound too good to be true? Believe me when I say that it’s for real. If one recipe could justify the purchase of a cookbook, this is it. Because if you never made anything else from Pam Anderson’s Perfect One Dish Dinners, her Chicken Pot Pie alone is worth the list price. With a minimal number of ingredients and the tiniest amount of effort, you too can enjoy potpie as it should be. Rich and creamy, hearty and filling, in no time flat. Just imagine the possibilities. BAH Note: I halved the amount of chicken Pam calls for in her recipe because I prefer a high ratio of sauce to chicken in my potpies. But that’s just me. I also reduced the amount of flour in the sauce by half because I kept ending up with lumps. That could have just been me also. Please don’t be tempted to substitute onions for the leeks. It just won’t be a good trade off. 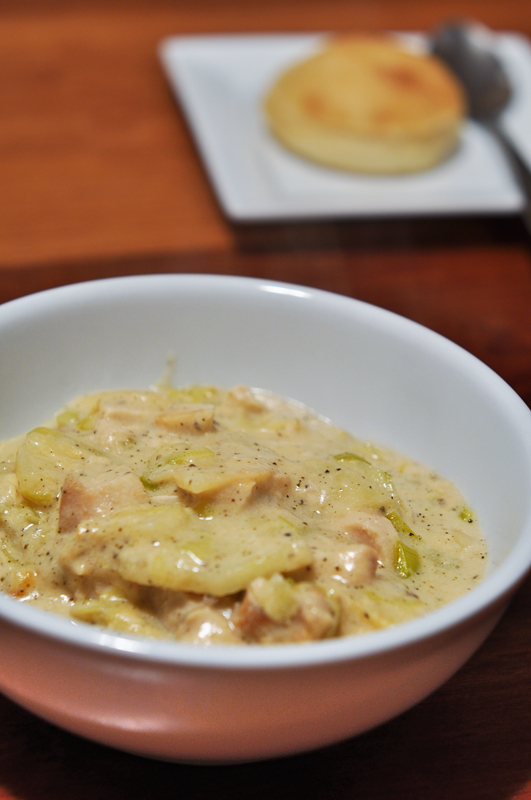 I was quite wary of the leek for the longest time…until I used them in this recipe. What I learned is that the leeks provide a subtle flavor and are the perfect complement to the apple and sage. I also learned that when you don’t have the ingredients on hand to make the quick drop biscuit topping, you leave it off and call it Chicken Stew. I made this in a 5.5 quart dutch oven. You could also bake it up in a 9×13 baking dish or two 9 inch pie plates, but I like keeping the number of dirty pans to a minimum. BAH Tip: Leeks are deceptive. They may look clean on the outside while the inside is full of gritty sand. You don’t want that in your dish. To remove the sand, cut the dark green tops off the leeks and then slice the leeks in half lengthwise. If there isn’t much sand inside, place the halves under running water and separate the layers to rinse the sand away. For particularly sandy leeks, fill a large mixing bowl with water, slice the halved leeks, and place the slices into the water. Use your hands to swish the slices around so that the sand falls to the bottom of your bowl. Use a slotted spoon or your hands to carefully remove the leek slices from the water, leaving the gritty sand in the bowl. Place oven rack in lower middle position and heat oven to 400 degrees. Microwave the chicken broth and evaporated milk in a large microwave safe bowl for 3 to 4 minutes until it is just steamy. Melt 2 tablespoons butter in a dutch oven over medium high heat. Add the leeks and apples and cook for 7 to 10 minutes until they are just tender. Transfer the leek and apple mixture to a large bowl. Add the shredded chicken or turkey to the bowl and set it aside. Melt the remaining 4 tablespoons of butter in the now empty skillet set over medium heat. When the foaming subsides, whisk in the flour and sage and cook for 1 to 2 minutes until golden. Slowly add the warmed milk, whisking until smooth, and simmer, stirring constantly, until the sauce thickens. Add the chicken mixture back to the pot and stir until it is combined. Taste for seasoning and add salt and pepper to taste. Top with biscuits and bake until the biscuits are golden brown and the filling bubbles, approximately 30 to 35 minutes. To make the biscuit topping, whisk together the flour, baking powder, baking soda, salt, and cheddar cheese in a medium bowl. Using the coarse side of a box grater, carefully grate the frozen butter into the flour mixture and mix quickly with your fingertips to blend evenly. Mix the buttermilk into the dry ingredients with a fork until the dough just comes together. Use your fingers to pinch small rounds of dough and place on top of the filling. I love this recipe too. This has become a regular in my dinner rotation, along with the Coq Au Vin Blanc, the Cassoulet Style Beans & Sausage, and the Pork & Sweet Potato Stew. I also love leeks. Now that this recipe has alleviated your fears, I suggest you try some potato leek soup, or some salmon & leek chowder. Leeks are delightful! Jennifer, this is my kind of comfort food…even without the quick biscuit topping. Have you tried the lasagna yet? Freaking fantastic. No, I haven’t – must put that on my to-do list. Have you tried the mac & cheese? So easy and good!!! The mac and cheese was good but it wasn’t my favorite. And that’s ok.
Hmm…I like the idea of apples in my chicken pot pie, although I’ve never tried that. Parsnips are good, too. Minx, the apples, leeks, and sage are a fantastic flavor combination in the pot pie. I’ve tried to become friends with parsnips but I think we’re destined to just be distant acquaintances. I still need to make this. Must add it to the dinner menu! Beth, you absolutely do need to make this. And soon. Sadly, my only experience with pot pies has been the frozen variety. All of those small cubes of carrot and rubbery chicken swimming in that tasteless sauce turned me into a picky pot pie eater. But this one has apples. And leeks. And sage. And drop biscuits. This is the real deal. Ali my friend, what you’ve eaten under the guise of pot pie is an abomination. You’re right, this is the real deal. And it is wonderful. i adore leeks and siriusly, this looks like such comfort! Lan, I think the Universe wants you to make this chicken pot pie. Please don’t let the Universe down. PS – did you start a new blog? snap. i always forget to log out of wordpress when i comment on other wordpress blogs. it gets confusing and then i get all out of sorts! and yes, i would hate to be the One who lets the Universe. that’s a lot of pressure! It sounds like a blogging case of multiple personalities. And no, the Universe does not take kindly to being let down. Jeanna, maybe I can read your mind. Or maybe I also suffer from fear of dough. I’ll never tell which it is. Yummy yummy yummy!! And I do dislike how things that taste oh-so-good don’t photograph as well as they smell. Either way, I’m on board for the pot pie – got my napkin tied around my neck and a fork in the left and a knife in the right. Bring it! Brooke, I have the highest respect for professional food stylists and photographers that can make any dish look good. Maybe in my next life, I’ll have those skills. If you and Mrs. Rev schedule a kitchen collaboration for those Puffy Hearts, perhaps you should add this pot pie to the menu as well. Oma, while I am personally not a fan of grapes in chicken salad (a world of wrong), I have become a huge fan of apples in my chicken pot pie. Especially when combined with leeks, sage, and cheese biscuit topping. It’s kind of like the best parts of Thanksgiving dinner all in one.